Part I: Memory and Knowledge Representation. Cultural bases of folk classification systems (B.G. Blount, P.J. Schwanenflugel). Deictic and intrinsic orientation in spatial descriptions: A comparison between English and German (M. Carroll). Time, memory, and knowledge representation: The Indian perspective (A. Agarwal). Effects of a bilingual context on memory performance (Z. Peynircio&gbreve;lu, A.Y. Durguno&gbreve;lu). Mental representations in developing modals: A cross-linguistic and cross-cultural review (T. Tanaka). Part II: Language Processing, Comprehension, and Reading. A comparison of Chinese and English language processing (M.J. Chen). The ordering of words in utterance production: An integrated view of the basic principles in German and Chinese (R. Dietrich, Z.X. Zheng). The role of cultural schemata in reading comprehension (J. Altarriba, W.J. Forsythe). Assessing language comprehension skills in cross-cultural settings (J.M. Royer, M.S. Carlo). Language-specific influences of phonology and orthography on emergent literacy (M. Caravolas). Cultural context in the development of children's narratives (J. Mistry). Arabic orthograpy and reading acquisition (D.A. Wagner, J,E. Spratt). Part III: Visual/Auditory Perception. Convergent perspective and divergent perspective: A cultural difference with a clearly perceptual cause (J.B. Der&eogon;gowski). From initial speech perception to language-specific processing: An overview of cross-linguistic research (C. Floccia, J. Bertoncini). Part IV: Reasoning and Problem Solving. A comparison of conditional reasoning in English and Chinese (F. Cara, G. Politzer). Sociocultural processes in the development of thinking (M. Gauvain). Abstract thinking (F.J.R. van de Vijver, M.E. Willemsen). Similarities and differences in the formal and informal mathematical cognition of African, American and Asian Children: The roles of schooling and social class (J.C. Davis, H.P. Ginsburg). An ecological approach to understanding cognition across cultures (J.W. Berry). Part V: Synthesis. 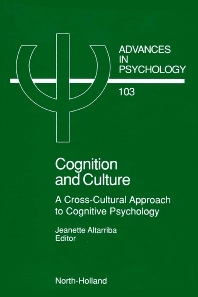 The influence of culture on cognitive processes (J. Altarriba). Authors. Author index. Subject index. While the main source of knowledge of human cognition has come from studies of information processing in a single culture, primarily within the U.S. or within certain countries in Europe, much research has also been conducted in other parts of the world. Can the study of cognition across cultures lead us to interesting conclusions about human cognition in general? Surely any general theory of language processing, for example, must be able to explain phenomena observed across cultures and not just within a single one. This book is an attempt to look at this issue of universals in thinking and understanding by providing a compendium of cross cultural investigations in the four major areas of cognitive psychology: (1) memory and knowledge representation, (2) language processing, (3) perception, and (4) reasoning and problem solving. The differences found across cultures are also fascinating and extremely informative. A final chapter provides a summary of the major findings reported in each of these areas. The chapters included in this work were written for those interested in cross-cultural psychology and also those with an interest in cultural anthropology. The authors are well-known in the areas of cross-cultural psychology, cognitive psychology, linguistics, and anthropology. However, the reader need not be an expert in any one of these fields to understand the conclusions and implications of the work reported here.